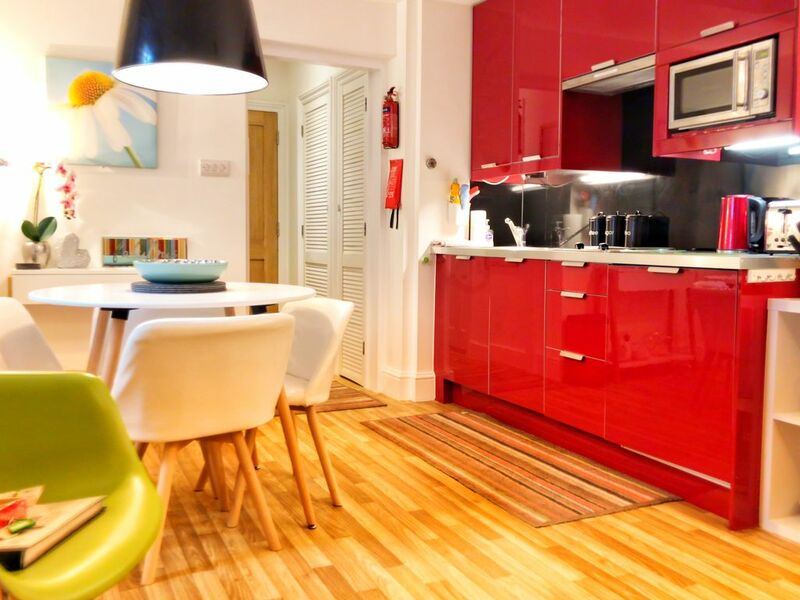 Bright and contemporary apartment right in the heart of Brighton’s famous lanes. This lower ground floor flat is more than a studio apartment and has ample space to accommodate up to four people with fully equipped kitchen, dining area, corner sofa/sofabed and separate sleeping annex leading off the main living room with king size bed, TV & a door leading to the small private terrace. Ideal for couples, friends, families and corporate lets. Kitchen Area: The modern fitted kitchen has everything you will need including two ring hob, microwave oven and grill, dishwasher and fridge with freezer compartment. The stylish red units are well equipped for you to be fully self-catered and are finished with coordinated toaster, kettle and accessories. Laundry room with washing machine and tumble dryer is located in the courtyard and shared with Brighton Lanes Studio 1. Dining Area: Table and chairs for four give you the space to enjoy dining together. Living Area: Laze on the sofa and watch the wall mounted flat screen TV with integrated DVD player. The L shaped seating area is sociable, comfortable and coverts into a sofa bed. It is tastefully finished with plump red cushions and a throw. Bedroom Area: Double bed in its own private annex with a curtain for privacy- quite a luxury for a studio apartment and gives a group of four or a couple with children more space. You can easily store your clothes and luggage in the large fitted wardrobe and storage cupboard in the hall. Bathroom: Hotel finish shower room with corner shower cubicle, sink, heated towel rail and WC. Complimentary Duck Island shower gel and hand soap is also provided. Courtyard: Courtyard accessed from the bedroom where you can enjoy eating alfresco. There is also a communal laundry outside the entrance door shared with Studio 1. Bits and Bobs: There’s a secure bike rack behind the entrance gate for those wishing to explore Brighton from the saddle. (1) STREET NOISE AT WEEKENDS: If you’re looking for total peace and quiet, please be aware that we are right in the centre of Brighton’s Old Town and it can get quiet noisy out on the streets around our building throughout Friday and Saturday nights. All of this is beyond our control - however, our prices do reflect this fact as similar apartments in Brighton rent for over £100/night. That said, the studio has double glazing and we even provide ear plugs for the really light sleepers. In reality, you are far more likely to be disturbed by Brighton’s seagull population who never seem to sleep! (2) HOME SAFETY: We are professional landlords and as such you can be assured that the whole building (containing five apartments all of which we own) meets all current safety standards. The building is also protected by a modern, fully maintained fire detection system with smoke and heat detectors in each apartment connected to a control panel in the communal hallway. The system is tested every Thursday morning by our contractors at Brighton Fire Alarms. Graeme and I run Brighton Lanes Apartments on Ship Street located in the heart of Brighton’s famous lanes. We have four self catering apartments in total and have being doing this since 2012. Because it’s fabulous and everyone who’s stayed here in the past 5 years has loved it! Corner sofa/sofabed with large wall mounted TV with built in DVD player. Fully equipped kitchen with plenty of pots, pans & utensils. Fully fitted and equipped with pots, pans & utensils plus enough plates, glasses & cutlery for 4 people. New SMART internet TV with over 100 Freeview channels & free Netflix access! James' place was a great place to stay in in Brighton. Just a few minutes from the beach, shops & restaurants. Very clean. Just perfect for the two of us. We wanted accommodation close to the Lanes and this studio gave us that. The bed was very comfortable and cosy. The Studio was the perfect base to explore Brighton, the Pier, Hove and Kemptown, all by foot. Lovely spacious apartment! Perfect location! Brighton Lanes, Studio 2 is the perfect location for your Brighton visit. Steps away from The Lanes and close to the beach and perfect for exploring the area by foot. The apartment has been perfectly appointed for your stay. There was nothing we couldn't find or lacked. The eating area is spacious and kitchen lovely and convenient. Bed is awesome & comfy & towels were perfect. We stayed 4 nights so we could explore Brighton and this was the perfect home away from home to come back to each night. We met our hosts upon leaving and they are both pleasant and gracious. You won't be disappointed in choosing this apartment. Thank you. Cosy studio in a great location. Our experience was delightful and would stay again. Be mindful of the party peeps walking down your alley at night. When you see complimentry ear plugs by the bedside, heed the warning! The property guide is thorough and can answer just about any questions regarding the property except the washer and dryer combo. Please add instructions for use, most people from the states have never used or seen one. The location is spot on for nightlife, Beach,food and pubs. This flat is about a 15 minute walk from Brighton station and 2 minute walk to the ocean. Boardwalk and other attractions about 10 minute walk. I enjoyed very much the stay in Brighton Lanes Studio2. James and Graeme were very helpful. The location is ideal, everything is very close. The studio is modern and well equiped. I would like come again. Thank you so much Ildiko. You were a pleasure to host! Once again, very pleased with my stay at the Brighton Lanes Apartments. I stayed in studio 1 back in October '17, which is adorable, this time I stayed in studio 2, just as nice but with more room and with a sweet little patio outside the bedroom. The location is the best, walking distance to everything and anything you need to see and do in Brighton! The studios are very comfortable, modern and well-equipped with everything necessary for an at home like stay. Overall a very nice experience! PARKING: Parking is very expensive across the whole city so we recommend coming down to Brighton by train or coach. Brighton Station is just 10/15 minutes walk away or a couple of minutes (and about £6) by taxi. The nearest secure carpark to us is The Lanes carpark on Black Lion Street BN1 1ND where it costs £25 for 24 hours. The best & cheapest option is to pre-book your parking in advance with Regency Secure Parking on Regency Mews, BN1 2HF which is only 10 mins walk (or 1/2 a mile) from us. 24 hours parking here costs £14 and a whole week is just £83. Search http://www.regencysecureparking.co.uk where you can book online. More public carpark information is available on Brighton & Hove City Council’s website in their parking section (www.brighton-hove.gov.uk). Also try Googling Parkopedia’s website as it offers special deals on parking across Brighton & Hove including the odd private space for hire (www.en.parkopedia.co.uk).